Great for removing unwanted debris.. 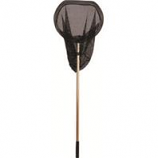 Coated frame protects pond liner and fish.. Telescopic handle extends up to 5.2 feet.. . .